Retired architect sharing his research and designs using superinsulation principles as developed in Canada and the PassivHaus Institute of Germany. Design based upon traditional design found in New Brunswick. Our North American way of life has been created and is dependent upon cheap fossil fuels, in particular, oil. As predicted by M. King Hubbert, we have now reached or will soon reach “peak oil” - the point in time when the maximum rate of global petroleum extraction is reached, after which the rate of production enters terminal decline. The rush to “peak oil” will increase as world demand increases. The potential ramifications of “peak oil” will dramatically change the global economy and our way of life - transportation, agriculture, habitation and industry. Concurrent with “peak oil” is the dramatic effect that burning fossil fuels - oil, coal, propane and natural gas - is having on the global climate. Human activity is raising the overall temperature of the planet with undeniable effects. Living in Canada, the signs of global climate change are obvious in the reduction of arctic sea ice, increasing melt of the Greenland ice sheet, increased release of methane from the permafrost, and warmer winters as temperature rise is greater than at the equator. As population increases, the amount of productive farm land decreases due to urban expansion and fertility depletion. The planet offers a finite amount of resources to sustain current human activity. Finite limits have not yet been met only because of the economic disparity between nations. Wealthier nations are increasingly consuming larger amounts of resources while poorer nations live on meager and diminishing resources. The resources of the planet are not adequate to allow all nations on the planet to consume resources at the current rate of the most developed nations. Human “sustainability” has already been surpassed, yet we still talk of the need for continued growth. The economies of the western countries - both Europe and North America - have experienced significant instability beginning with the 2008 United States housing bubble implosion (how far behind is a housing bubble in Canada?) and now the Euro crisis in Europe. Governments have shown an inability or unwillingness to confront the imperatives of peak oil, global warming (Europe doing better here), increased exploitation of natural resources, and inequality between nations. As individuals, we may not be able to significantly impact the world on the macro level, but we do have the ability to affect our impact on the planet within our local communities, neighborhoods and homes. In order to survive as a species, we must live our lives in harmony with the natural parameters of planet Earth. Christmas has come and gone and its time to continue discussing people that have a profound influence on my thoughts. Ross Chapin is an architect that has developed some fantastic designs of homes and cottages that he is more than wiling to share. I must admit that I envy his ability to design spaces with a true eye to detail. His homes provide a warmth and earthiness that is immediately appealing. Ross has gone one step further and written a fantastic book "Pocket Neighborhoods - Creating Small Scale Community in a Large Scale World". This book illustrates where I would like to go with my blog in the future. We all to often focus on "a building" or "the building", but avoid the context in which it will exist. His work offers a vision of how people can live in a community that fosters social interaction. This book is a must for anyone pursuing studies in architecture or anyone developing a more sustainable way of living. Marianne Cusato is an architect that is best known for her Katrina Cottage, a housing type resulting from the devastation on New Orleans by hurricane Katrina. 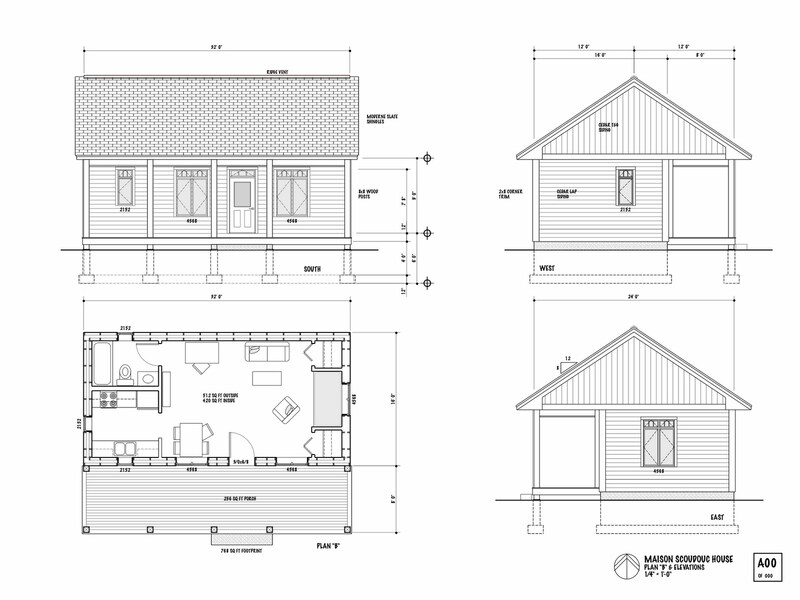 The Katrina Cottage concept came out of the New Urban Guild and propelled Marianne into national recognition. Once again, I am inspired by the simplicity and traditional character of her designs. Katrina cottages have been built to replace homes lost in the hurricane as well as incorporated into pocket neighborhoods. Katrina Cottages have even been sold as kits by Lowe's Hardware similar to the kits for Sears Homes. What's most important about the work of Ross Chapin and Marianne Cusato (as well as others) is their willingness to openly share their work. If we are to transition into more sustainable communities, it will be imperative that we all openly share our knowledge. This is not the time to hoard information and ideas for personal pride or monetary gain. Food, clothing and shelter are too basic to become the domain of a few. As design professionals, we have an obligation to discuss and provide our musings with society at large. I invite all to share in this ongoing adventure of discovery. I am beginning my series of posts introducing readers to the musings of Stephen A. Mouzon, an architect located in Miami, Florida. Steve provides us with a vision of human development based upon principles that have been with us historically, but we have moved away from since the development of our car based culture. Steve has a very compelling way of putting into words and pictures what we are often looking for in designing living communities. I find his website The Original Green often inspiring and thoughtful. I would recommend anyone interested in how energy efficient housing can be incorporated into a community context to join me in frequenting his website and reading the posts in his blog. Nourishable because if you cannot eat there, you cannot live there. Accessible because we need many ways to get around, especially walking and biking because those methods do not require fuel. Serviceable because we need to be able to get the basic services of life within walking distance. We also should be able to make a living where we are living if we choose to. Securable against rough spots in the uncertain future because if there is too much fear, the people will leave. Lovable because if they cannot be loved, they will not last. Durable because if they cannot endure, they are not sustainable. Flexible because if they endure, they will need to be used for many uses over the centuries. Frugal because energy and resource hogs cannot be sustained in a healthy way long into an uncertain future. I just noted that I have not added any comments to this blog since April 2010. This has not been due to lack of interest or ideas. I have simply been meeting new folks and investigating new directions. Super insulation concepts are still the way to go when building a home in my climate - the Canadian Maritimes - or any other cold weather climate. The long term energy savings are real. Building codes are being upgraded (too slowly) to reflect the need for more insulation, more air-tightness, and controlled ventilation. 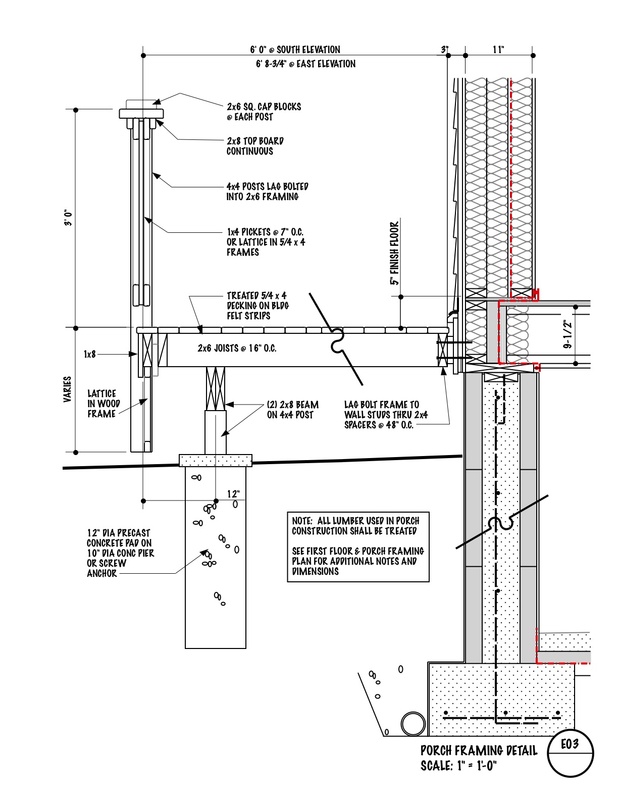 Besides the detailing and dialog provided in past postings focusing on double stud wall construction, I have been looking at other techniques and materials (ICF, vertical truss joists, straw bale, etc.). I have found the Green Building Advisor as a valuable resource for information and discussions - in particular the Musings of an Energy Nerd blog. While there is much to be learned in the ongoing development of super insulated design and construction, my energy is also focused on the context of the home within the larger environment. While I am always open to any questions or comments you can share, my upcoming posts will try to lead the readers to issues and sites that discuss energy efficient housing in a broader context that responds to cultural transitions we are currently experiencing. 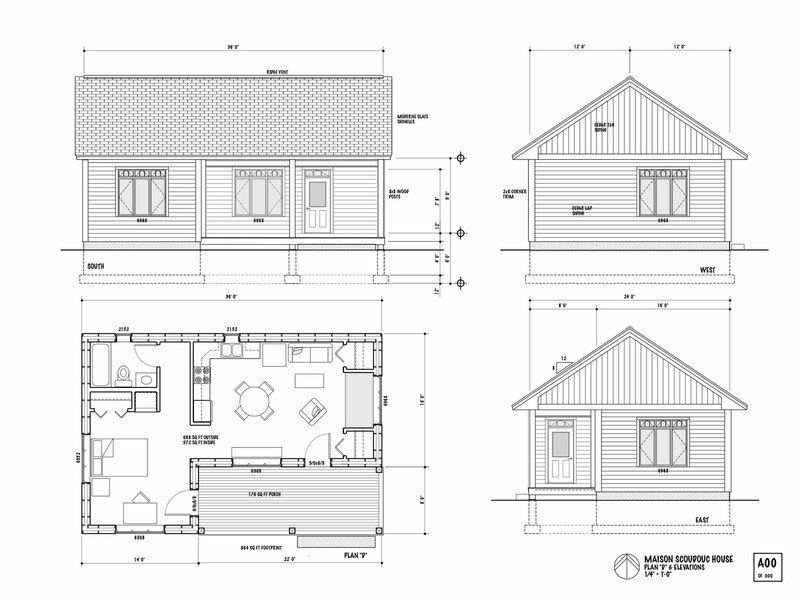 MAISON SCOUDOUC HOUSE PLAN "A"
The Maison Scoudouc House Plan "A" is designed as a small 512 sq.ft. mini-home for a single person. 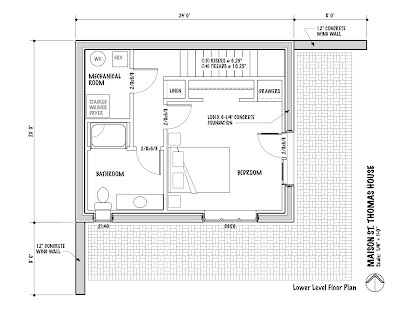 This size is in line with the recommendation of 500 sq.ft. per person for the size for a basic superinsulated house. A single person needs much less enclosure of spaces. In this basic house the bathroom is the only interior room with a door. The home has a basic galley kitchen and open living room. Rather than having a bedroom, this design has a sleeping alcove with adjacent closets for clothing and drawers under the bed. 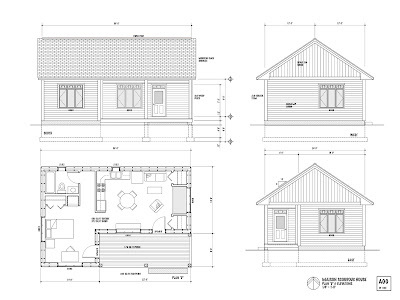 The super insulated construction techniques include ICF crawl space foundation, double exterior stud walls (R45), triple glazed casement windows sized for 16" o.c. stud spacing, and raised heel roof trusses (R60). See link to Construction Details for more information on materials and detailing. 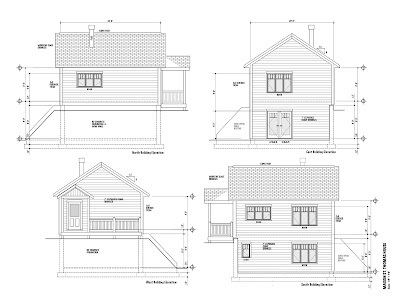 MAISON SCOUDOUC HOUSE PLAN "B"
The Maison Scoudouc House Plan "B" design is the same small 512 sq.ft. mini-home for a single person, but with a 256 sq.ft. covered porch. The porch could also be enclosed as a heat sink during cold months and an expansion of living space during warm months. The floor plan is the same as the Plan "A" with the same features. 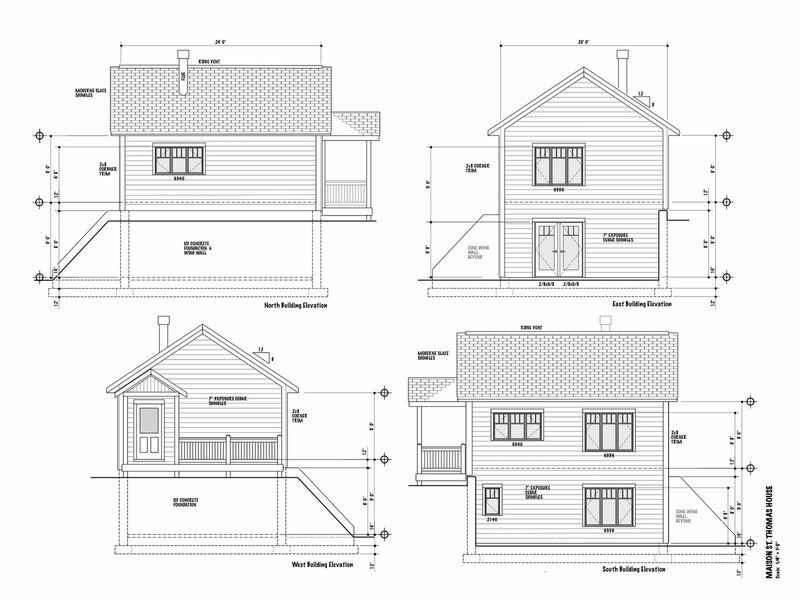 The superinsulated construction techniques include ICF crawl space foundation, double exterior stud walls (R45), triple glazed casement windows sized for 16" o.c. stud spacing, and raised heel roof trusses (R60). See link to Construction Details for more information on materials and detailing. 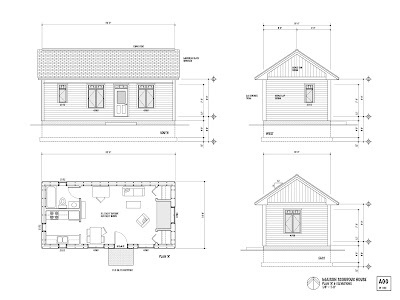 MAISON SCOUDOUC HOUSE PLAN "C"
The Maison Scoudouc House Plan "C" is designed as a small 624 sq.ft. 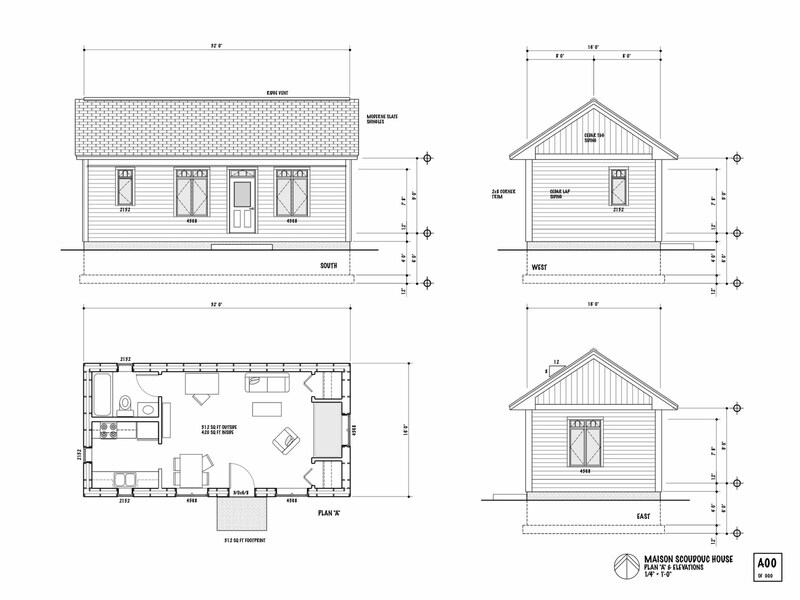 one-bedroom home or retirement cottage for a single person or couple. 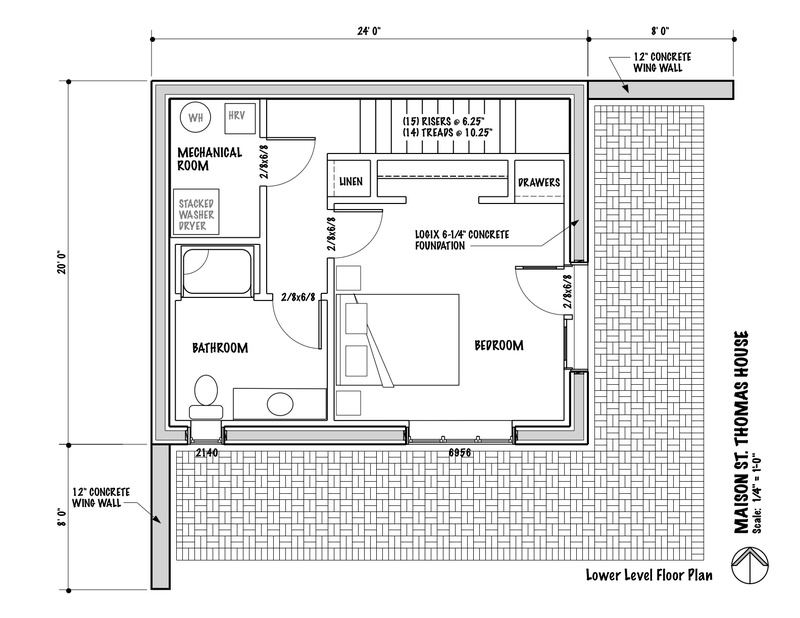 The 144 sq.ft. covered porch is accessible from both the living room and the bedroom. In this basic house the bathroom is the only interior room with a door, but a door could be also be added at the bedroom for privacy. 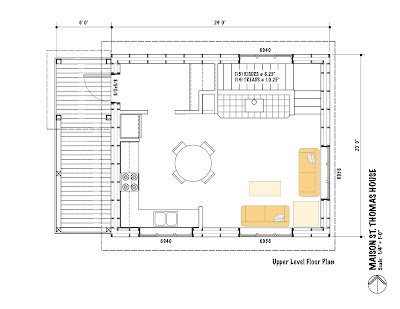 The plan contains a combination living / dining room with an L-shape kitchen, bedroom and full bath. 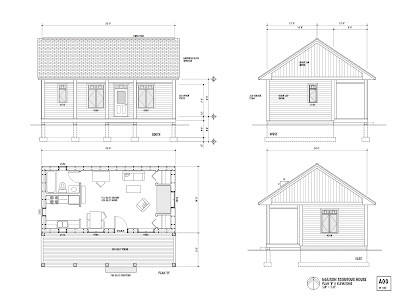 MAISON SCOUDOUC HOUSE PLAN "D"
The Maison Scoudouc House Plan "D" is designed as a small 688 sq.ft. 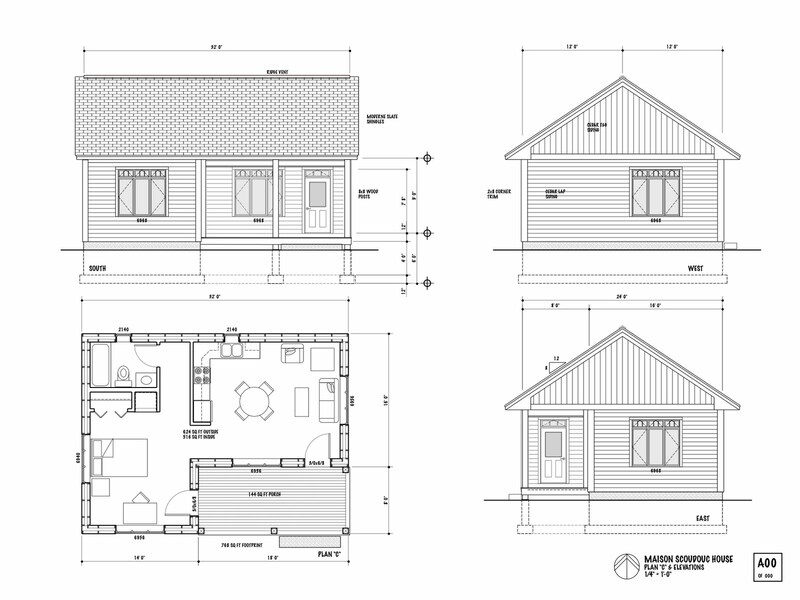 one-bedroom home or retirement cottage for a single person or couple. The 176 sq.ft. covered porch is accessible from both the living room and the bedroom. In this basic house the bathroom is the only interior room with a door, but a door could be also be added at the bedroom for privacy. 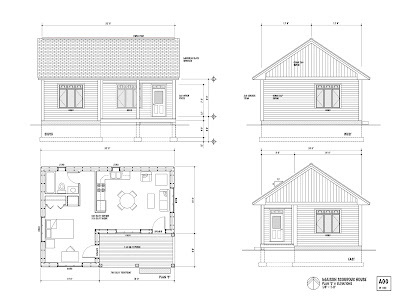 The plan contains a combination living / dining room with an L-shape kitchen, bedroom and full bath. In addition to the private bedroom, this design also has a sleeping alcove with adjacent storage closets and drawers to accommodate daytime napping and visitors. Maison St. Thomas House was designed for a friend in Nova Scotia to be built into a hillside overlooking the Bay of Fundy. The concept was to build a small one bedroom house (960 sq.ft.) with both a southerly and easterly view. Originally, the house was not designed to super insulated principles, but has been modified - more insulation, triple pane windows, HRV ventilator. Materials and detailing would be similar those shown for the Maisons Cocagne and Grande-Digue Houses in earlier posts (see Archives and Construction Details in links). The upper level of the Maison St. Thomas House is the public level of the home. the entry foyer can serve as both closet and pantry. 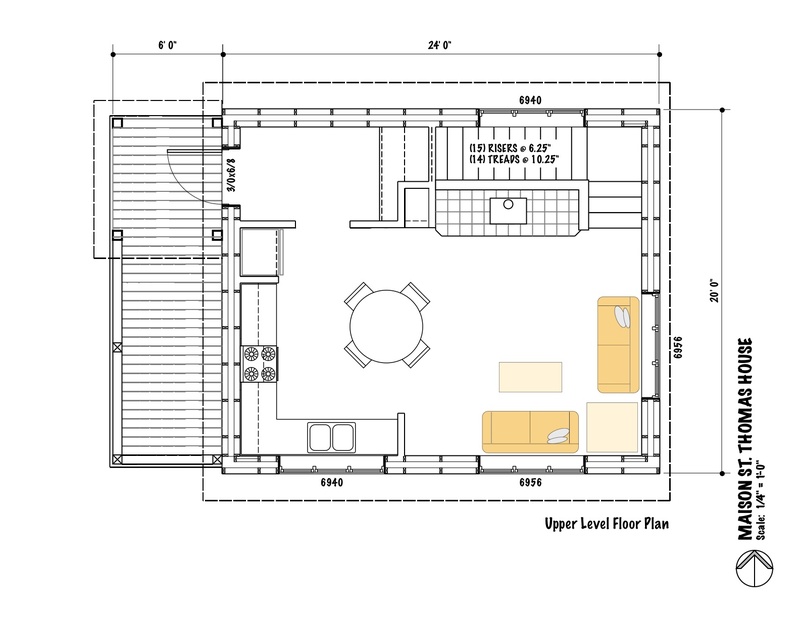 The upper level plan is a large open space composed of the living room area and a kitchen area with a table built into the kitchen cabinetry. The wood stove would be a pellet stove with an outside combustion air source (a must in superinsulated houses) to be used for backup and/or tempered heating. 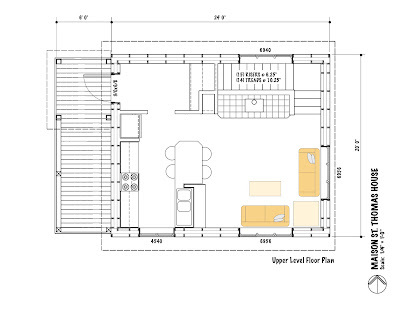 This is a similar upper level floor plan, but with an L-kitchen with separate table and chairs for dining. Wood stove would follow comments above or could be replaced with a few baseboard heaters. The projected heating load would be reduced by the super insulated features where supplemental heat demand would be low. Ground source heat pump could be overkill as the demand is so low, but a heatpump water heater may have potential for hydronic or fancoil heating. The lower level of the Maison St. Thomas House is the private area of the home containing he bedroom and bathroom. This level would be sheltered by the earth on the west and north elevations, and open to a walkout patio or garden on the south and east elevations. The south and east patio areas of the lower level could also have a covered porch if so desired. The exterior decking of the Maison Grande-Digue House can be done in any of several porch decking techniques. It is critical however that the deck framing be spaced from the building to prevent rot. 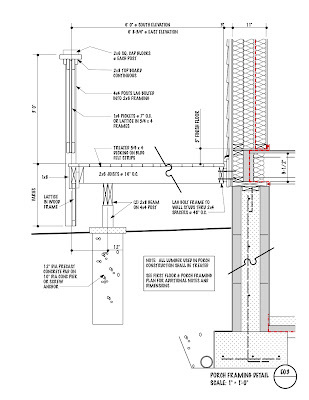 All structural framing members should be topped with strips of asphaltic, water resistant building paper or ice shield. Materials shown are treated materials using appropriate fasteners for the treatment used. Architect retired after 22 years service with Missouri State Parks. Current interest is researching the transition to a new economy that includes energy efficient housing design.